Corrosion is a natural process and upon exposure to the marine environment, metals gradually revert to their original oxidized stable condition. Even if a good coating system applied on the submerged hull may help in reducing corrosion, it is not possible to eliminate the need for correctly designed cathodic protection system. 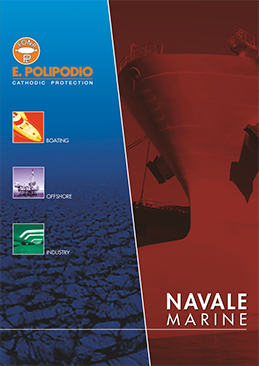 The industrial activity of cathodic protection products dedicated to the marine sector began in E. Polipodio in 1957 with the production of galvanic anodes. 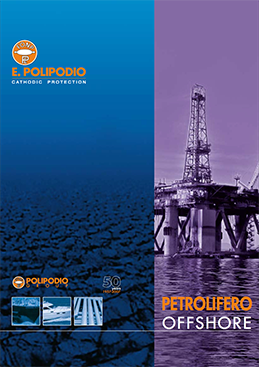 During the 60 years of experience in cathodic protection, E. Polipodio has been able to collect data and specific experiences that have allowed the company to go through all the aspects linked to the corrosion of metallic surfaces in contact with salt water. The wide range of products for hull and tanks on board of ships can suit any class and size of the vessel, trading in a different environment, and featuring any type of specification. Sea chests and pipe-work suffer moreover the problems of fouling growth, increasing considerably their maintenance costs. This problem has been faced and solved by E. Polipodio developing a series of antifouling products to assure a long-term functioning of the ship cooling systems. The experience achieved in the marine field in cathodic protection business, and particularly in monitoring and control of cathodic protection devices, has allowed E. Polipodio to transfer our know how to the leisure boating industry both for steel, aluminium alloy and fibreglass yachts. The development of the pleasure craft sector in Italy leads the company to increase the production of anodes. 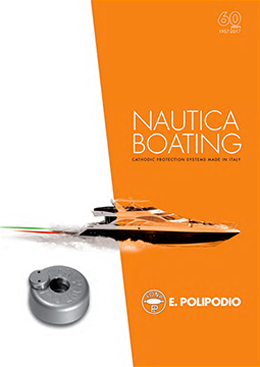 Since 1974 E. Polipodio has produced over 3500 different products dedicated to the boating sector. Many efforts have been spent along the years in order to evaluate the specific demands of this market sector, making the on board components compact and light as much as possible, minimizing the size of the equipment, and identifying simple and efficient solutions for the crew. Platforms and offshore structures are designed and constructed for a long term lifetime (generally an excess of 20 years). Due to the requirement of a long term protection from corrosion for oil and gas structures, it is essential that the highest quality standards are met when designing and producing for these type of applications. In 1990 E. Polipodio enters the world of oil industry with the production of large anodes for platforms and submerged pipelines. Manufacturing is supported by a modern and well equipped laboratory with facilities for spectrographic chemical analysis and electrochemical testing for alloy and product efficiency control. Third Party’s certification can also be provided upon request, to meet the requirements of offshore operators for detailed records. Industrial complexes like refineries, underground pipelines, power stations, water treatment plants, coolers, tanks, and many others are metallic structures in contact with an electrolytic environment such as soil or water need to be protected from galvanic corrosion. Besides the application of protective coatings, and the use of special construction materials, cathodic protection systems must be considered using sacrificial anodes, or impressed currents, or a combination of both, in order to assure the long lifetime foreseen at the design stage. 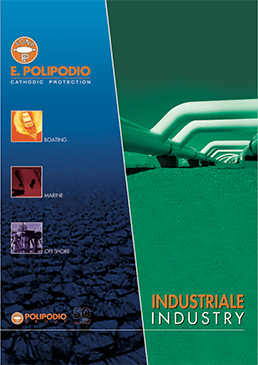 So, since 1999 E. Polipodio has been also active in the industrial sector with products for cathodic protection of gas pipelines, aqueducts, tanks and all the complex industrial structures. The majority of harbor installation like piers, quays, sheet piling are made of steel and immersed in seawater, so operating in a highly corrosive environment. The necessity to protect them from corrosion is then mandatory and it is essential to take corrosion problems and cathodic protection solutions into account since the very beginning of the project, starting from the preliminary engineering stages, as the structures are designed to be long-lasting (generally in excess of 30 years). E. Polipodio is a specialist in the design, manufacturing and supply, commissioning, monitoring and maintenance of cathodic protection systems for these marine structures, designing solutions in compliance with the main international standards, under the control of our ISO 9001:2008 certified quality management system, and identifying suitable and practical solutions to meet the specific requirement of the project. Notable successes have been the anode supply to Panama Canal project and the doors of Mose project. – Technical assistance for E&I, mechanical, architectural, piping and structural installation.